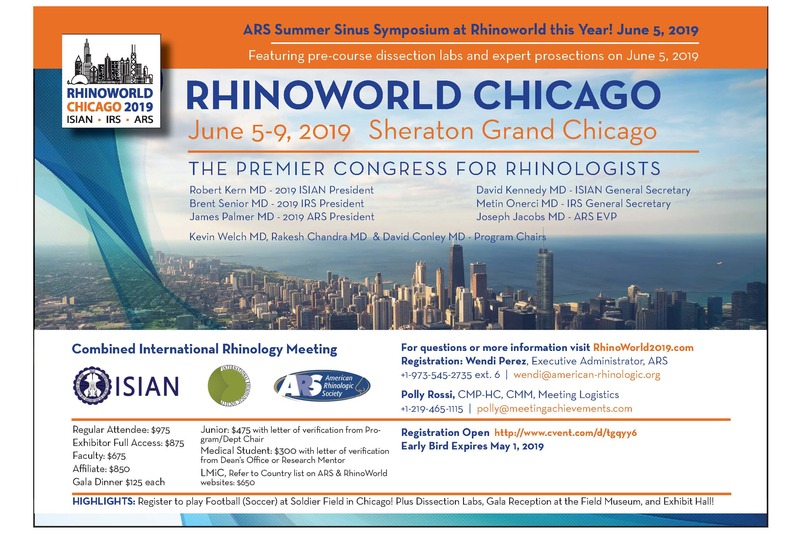 There are many great cities and many great meetings but in June 2019, you will have the opportunity to experience both asRhinoworld 2019 comes to Chicago. Many things have changed in that time but we are very confident that you will find whatever you want both professionally and socially from this conference. This conference will bring together clinicians and researchers from around the world to examine the very best in rhinology and all its related specialties, including allergy, ENT, skull base surgeons, and immunology to facial plastics and oncology. The conference will be held at the Sheraton Grand Chicago, ideally situated in downtown Chicago on the riverfront. We will do everything we can to make this a scientific event that is relevant, instructive and innovative for you at all stages of your career. And what better place to experience it than in the heart of the Midwest, in Chicago, brimming with history and culture, where Art and Science will truly meet. Join us for four days of plenary sessions, symposia, instructional sessions, roundtable discussions, debates, workshops, networking and much more!